Peanut butter heaven is a place on earth—and you can take it with you anywhere! 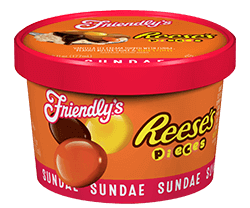 Indulge in premium vanilla ice cream, fudge topping, peanut butter & Reese’s® Pieces® Candy.—all in one single serving Sundae Cup! Valid as of 10/19/17. Please be sure to check the actual product label for most updated nutritional and ingredient information since the information contained here may have changed. Milk, Cream, Skim Milk, Sugar, Corn Syrup, Candy (Sugar, Partially Defatted Peanuts, Partially Hydrogenated Vegetable Oils [Palm Kernel And Soybean Oil], Corn Syrup, Dextrose, Contains 2% Or Less Of: Artificial Color [Yellow 5 Lake, Red 40 Lake, Yellow 6 Lake, Blue 1 Lake], Salt, Resinous Glaze, Soy Lecithin, Modified Cornstarch, Carnauba Wax, Vanillin [Artificial Flavor], Milk), Peanuts, Whey Protein Concentrate, Whey, Buttermilk, High Fructose Corn Syrup, Vegetable Oil Shortening With Soy Lecithin (Partially Hydrogenated Palm Kernel, Soybean And Cottonseed Oils), Corn Oil, Cocoa (Processed With Alkali), Vanilla Extract, Salt, Guar Gum, Mono And Diglycerides, Xanthan Gum, Phosphoric Acid, Carrageenan, Annatto Extract And Turmeric (For Color).